Hi. Over the years Dead River Rough Cut has gone through many incarnations. Once it was 90 minutes and then it was 30 minutes. Now it is 60 minutes. Unfortunately, Richard and I have lost some important footage that just may be on an old VHS tape somewhere. Specifically, we're looking for a scene where Bob complains that the police will no longer allow him to live in his car. 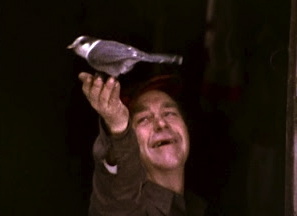 There is also a scene where Bob compares politicians in Washington to rats in his basement, and you know what Bob would do to Rats in his basement. I find these fellas interesting. Sure would be nice to see any additional footage. Any more info available on their vehicle that is show at the start of the movie? The vehicle that you refer to, was called a "doodlebug" by Walt and Bob. Walt built it, and it was powered by a VW engine. I recently watched the movie and was moved by several scenes. I've known people in rural Maine like Bob and Walter all my life, several in my own family. Those guys are exactly like my great uncles were, when they came back from WW2, and worked in the woods hunting and trapping. Not quite right in the head, yet resourceful and interesting. Is this anything like Brokeback Mountain? Dead River Rough Cut is nothing like Brokeback Mountain. 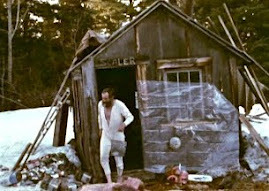 I love this film - one of the most astonishing documents of life in Western Maine ever made - I am not sure it is in any way typical - those guys are unique specimens, but it's a remarkable film. And they are remarkable people. Glad it exists. One of my alltime favorites! I knew Bob and miss his story telling. I guide in the area and recognize several of the locations filmed, but not so sure about a few.... Would it be be possible to interview you or could you post pins on google earth or something similar? This film IMHO needs to be preserved with as much supplmental info as possible! Never posted "pins," but you can interview me if you like. It's been a long time, although Richard and I do remember some of the locations. I believe its a vw. Asked one of Walters sons, and that's when he remembers it was. Stu - Have you found the missing footage? The first time I saw DRRC -many years ago- an old friend let me use his copy and when I bought mine I thought its content was different in spots. Anyway let me know as I will get back to my camp in a while and I'll ask him if you like. There have been many incarnations of DRRC. Some of the original footage has probably been lost forever. Anyway, the version we have now is is something that Richard and I are pleased with.